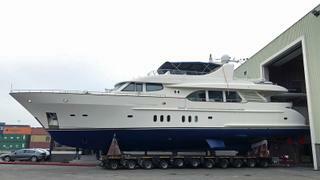 The 28.93 metre aluminium motor yacht Ciao has completed her winter refit at parent yard Moonen. Ciao (ex-Nilo) arrived at the Dutch yard in November 2017 having travelled up from her Mediterranean base for the work. Upgrades included new electrical zero-speed stabilisers from CMC, new anodes and two fresh layers of antifouling on her hull. After the eight-week refit, Ciao spent the rest of the winter in Moonen’s climate controlled hall and departed earlier this month (April 13). 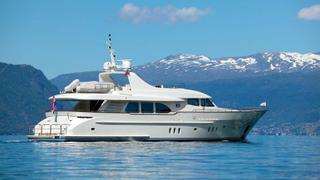 First launched in 2007 as part of the yard’s Alu 94 series and last sold in September 2015, Ciao features Art-Line interiors and exterior styling by Rene Van Der Velden. Accommodation for up to eight guests is offered across four en-suite cabins, arranged as two twin rooms, a VIP suite and a master cabin, while the compact crew quarters allows for a staff of two people. Power comes from a pair of 1,825hp Caterpillar C32 ACERT diesel engines for a top speed of 26 knots and comfortable cruising at 19 knots. When trimmed back to her economical speed of 11 knots, Ciao boasts a cruising range of 2,500 nautical miles thanks to a total fuel capacity of 18,900 litres. Other superyacht projects currently underway at the Dutch yard include the 36.3 metre Project Martinique, which is offered for sale and available for delivery this year.